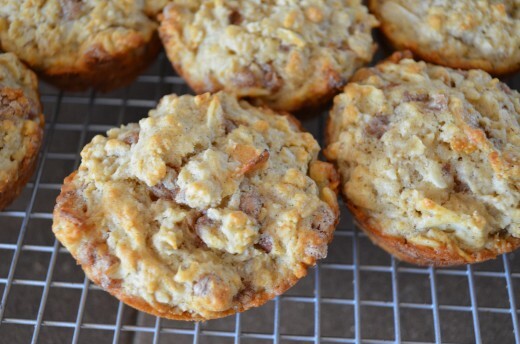 I've made oatmeal muffins for years because I love anything with oatmeal in it. 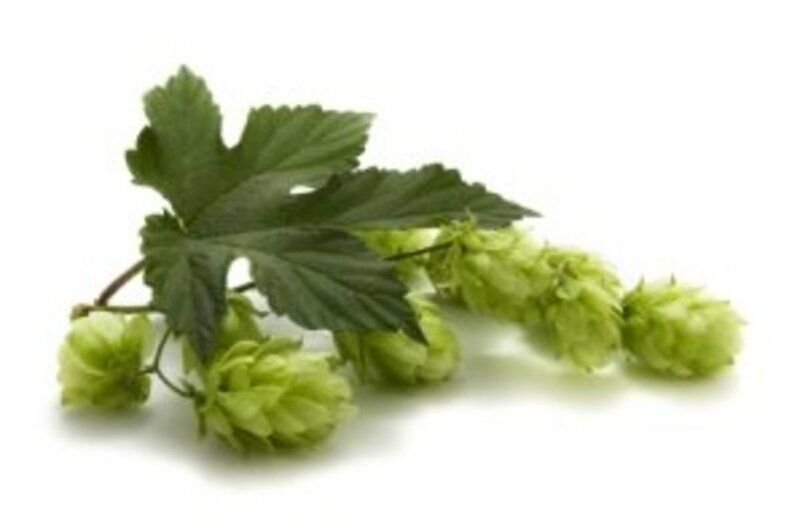 I think it's good for you on so many levels and it's an easy-to-tolerate grain with many excellent healthy benefits thrown in. I prefer to use whole or rolled oats (or even oat groats) rather than quick oats because the more processed a grain is, the less of its nutrient value it retains. Soaking the oats in the milk or buttermilk softens the oats; buttermilk especially adds another flavor dimension to the muffin. Look for cinnamon chips in your supermarket where the chocolate chips are sold. I bought mini cinnamon chips at a local health food store in a bin. What's nice about this particular find is that they were organic. They don't have any coloring or flavoring added in comparison to the store bought brand. They are paler in appearance but I love the fact that they're not color enhanced and they're miniature as well. I am a particular fan of mini chips in all my muffin recipes. I also had dried pears on hand so I used those to complement the cinnamon and the oats. It turns out they were a great addition though any dried fruit (or frozen blueberries for example) would go great in this recipe. I tossed in some slivered almonds and some toasted coconut because I like those things with cinnamon and pears. They too made a great adjunct to the recipe. 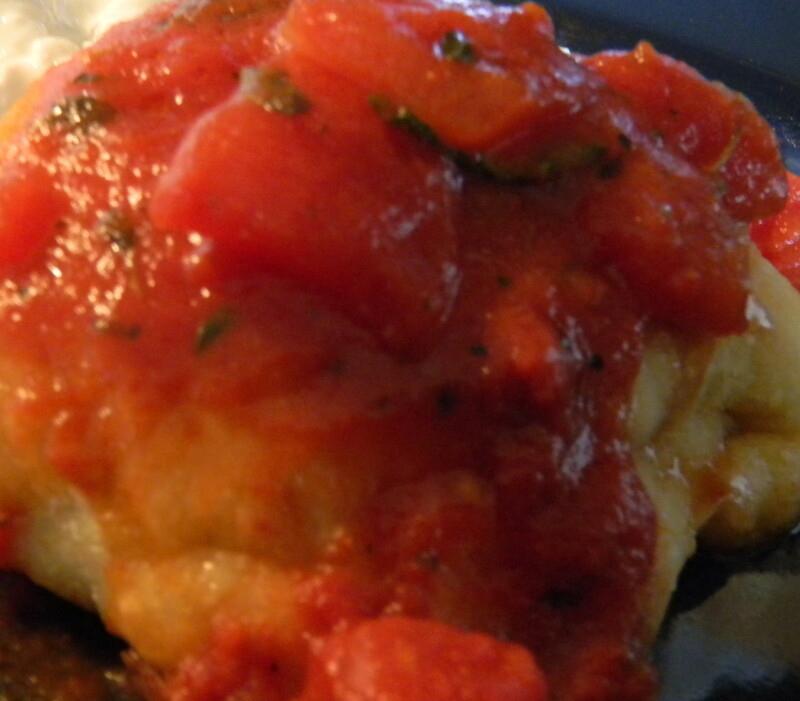 You can substitute all kinds of things in this recipe and come up with a winner. See the suggestions below. Preheat oven to 375 degrees. Use walnut oil to thinly grease muffin tin or line with muffin cups and brush insides with walnut oil. (Or lightly spray with cooking spray). 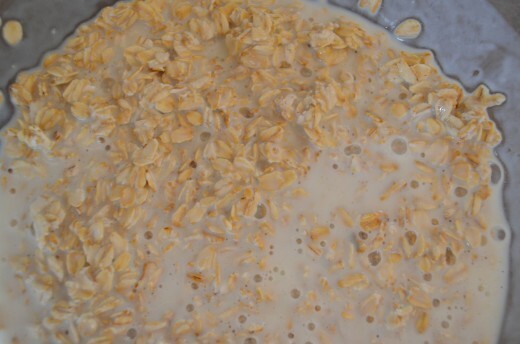 Combine oats and buttermilk (or nonfat milk and vinegar) in large bowl. Mix and let sit uncovered for 1 hour. 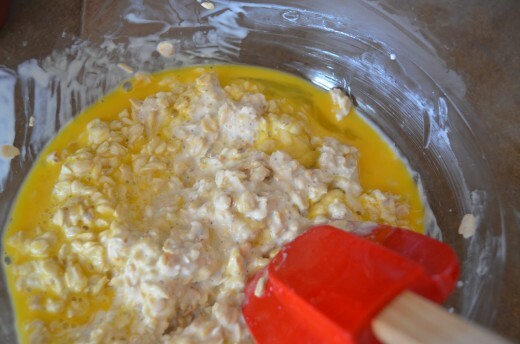 After the hour, add egg to the buttermilk mixture. Stir to combine. Add brown sugar and stir to mix again. Add melted butter or substitute and stir again to combine. Whisk together thoroughly in a medium bowl the flour, salt, baking powder, baking soda and spices. 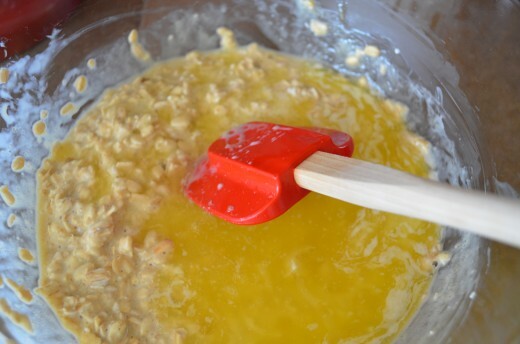 Add the dry ingredients to the wet ingredients with a rubber spatula, turning the bowl a quarter turn to combine--you should only use about 12 strokes to mix together. The more you mix muffin batter, the harder the muffins become. It's okay (and normal) for bits of flour to show in baked muffins! 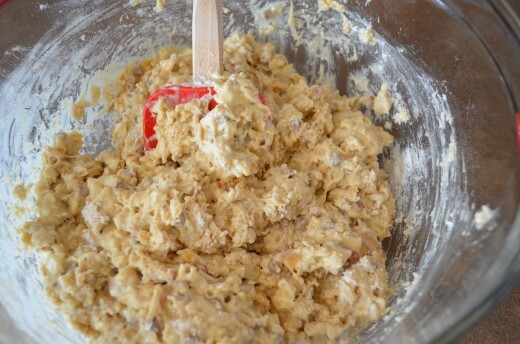 Lastly, add the mixture of nuts, fruit, coconut and cinnamon chips, again taking care not to overmix the batter. The muffin batter should be a very stiff batter. Use a 1/3 cup measuring cup (you can spray if you like with cooking spray) to scoop out muffin batter into the tin. Or use an ice cream scooper that is about the equivalent of 1/3 cup. 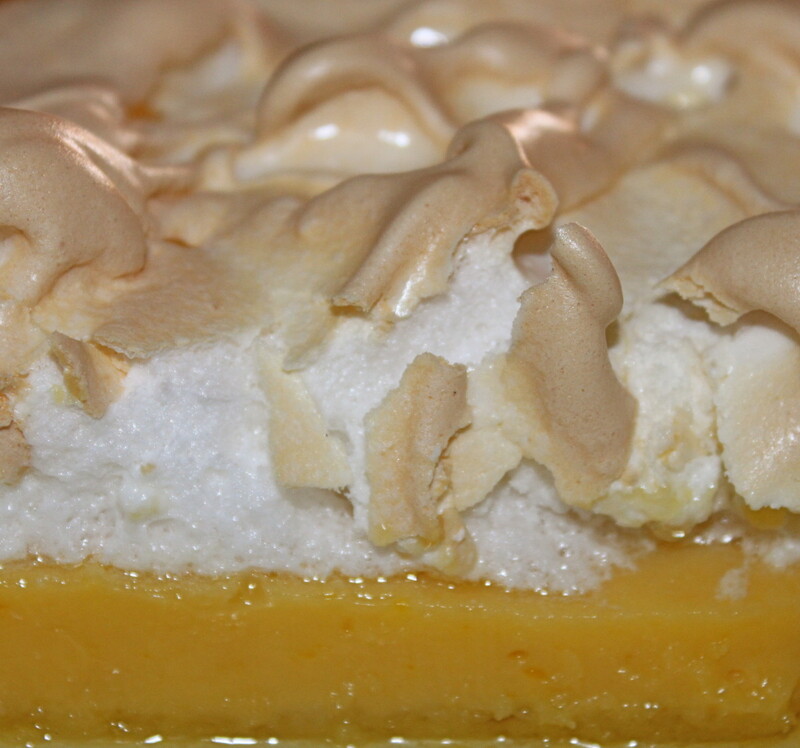 Bake until light brown and springy to the touch, about 10-12 minutes. These cook faster than some muffins and are baked at a lower temperature. Allow a few extra minutes if using fresh or frozen fruit. Mix together buttermilk (or nonfat milk plus vinegar) and oats in a large bowl. Stir to combine. Let soak for 1 hour. 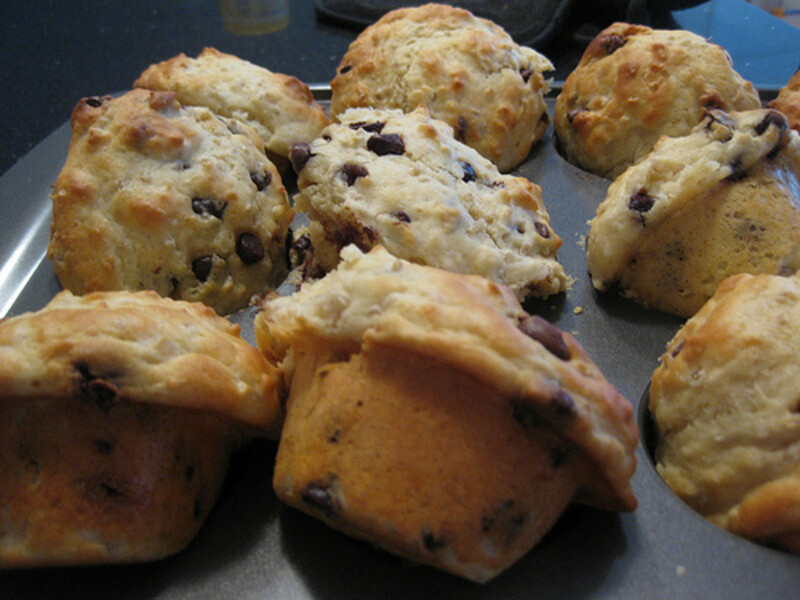 Buttermilk adds great flavor to oatmeal muffins. Add egg to buttermilk mixture. Stir to combine. Have egg at room temperature before adding to mixture. Add brown sugar and stir to combine well. Stir in brown sugar and mix well. Add in melted, cooled butter or substitute. Stir again to combine well. Cool melted butter to room temperature before adding. 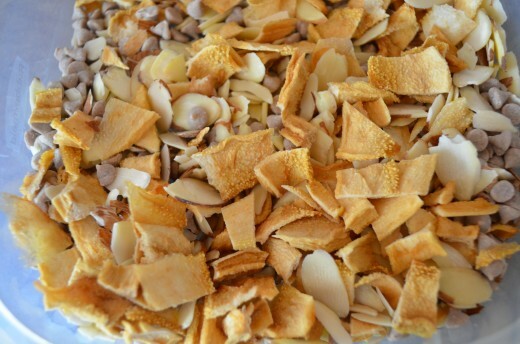 Mix all ingredients well--if desired, you can add a wee dash of vanilla or almond extract to the batter. Stir ingredients well at this stage. 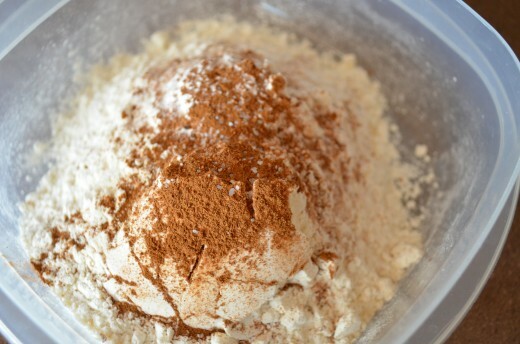 Mix dry ingredients together and whisk well to combine in a medium bowl. Whisk together flour, baking soda and powder, salt and spices. Sift through a metal strainer if desired. 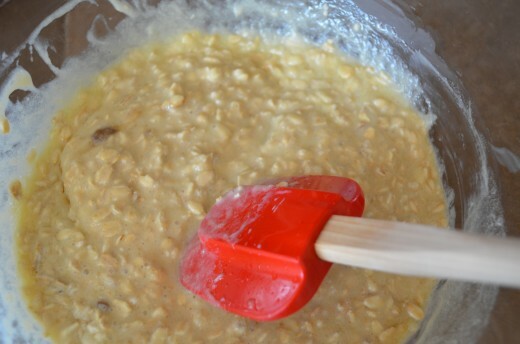 Add dry ingredients to oatmeal mixture being careful to not overmix. You should only stir muffins about 12 times. It's okay to see bits of flour in the batter. Add in the mixture you've prepared that equals 1 cup--in this case cinnamon chips, nuts, dried pear and slivered almonds. Try different add-ins for great varieties of oatmeal muffins. Add the nut, chip and fruit mixture and stir very gently with only a few turns. The batter should be very stiff. The batter will be very stiff but oh so yummy! Spoon into muffin tins as above, bake and let cool as directed. Nothing like a hot muffin on a cold day straight from the oven. Oatmeal and buttermilk muffins offer many different options and here are just a few. 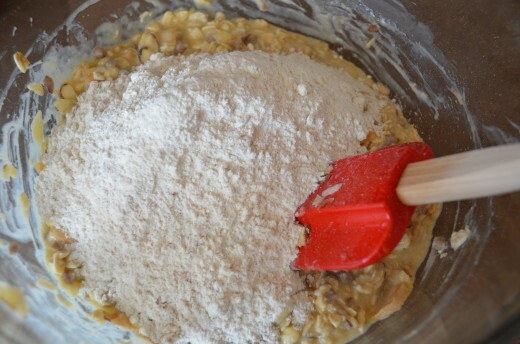 Replace the 1 cup mixture up above with just about any dried fruit and nut combination. Just remember to allow extra time for baking if fresh blueberries or other fresh fruit is used. The same holds true for frozen fruits. I've always used them interchangeably and never had a problem! Happy cookie making! Some specialty shops have cinnamon chips and you can also order online. Cinnamon chips? Where do I get those? And what if I use quick oats instead? Thanks Maddie - actually the hardest part of the whole hub was finding the chips! I stood looking directly at them for 10 minutes--I kid you not--because they are packaged exactly the way chocolate chips are--same front, same color....and it turns out I had the mini chips all the time at home in my well stocked pantry!! It really pays to be senile! Your photos are simply mouthwatering. I'm going to have to look for cinnamon chips so I can try out this recipe. Enjoy - and those sound pretty dang tasty too~~ Wishing you cooler temps and happy baking! I have some butterscotch chips in the cabinet, I think I will use those and make some muffins today. After all we did have a 'cool' front come through and drop the temp to 90 instead of 102. Oooh, break out the sweaters and light the oven! These look fabulous and I love the fact that you give so many variations. I'm always changing things up in my muffins depending on what I have in the house. I've never seen cinnamon chips. I'll have to look for them. I bet these would be good with just the fruit and coconut too. Pinning! Om - supreme-o compliments from the greatest photographer E-VER~ Thanks--I do okay with food~~~ I think it has something to do with my camera setting though---not the operator! These muffins sound delish! I love that you use one whole cup of rolled oats in this recipe, which makes these muffins fiber-rich and healthy. I've never tried cinnamon chips before but will look for them next time I go shopping. Oh and one more thing; all these pictures are really awesome! 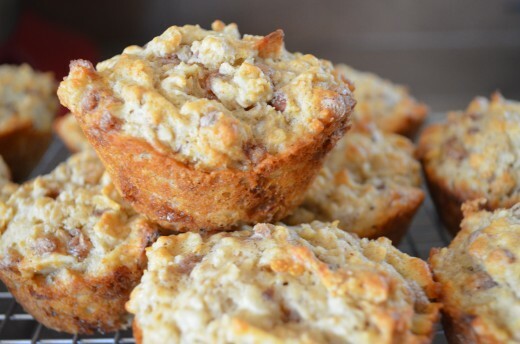 Audrey - I know oatmeal is good for us and although I'm not a fan, your muffins photo is so tantalizing, and your specific recipe information is so compelling, I think I may have to cook up a batch of these to taste for myself. Adding dark chocolate mini chips of course. 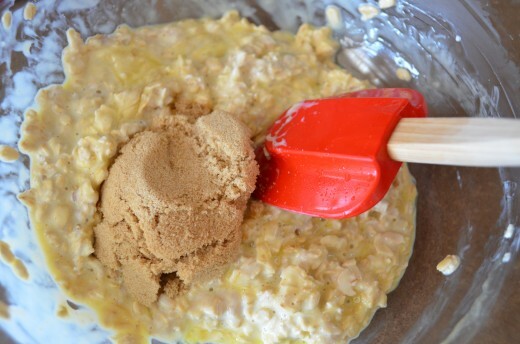 Oatmeal and cinnamon are two of my favorite ingredients, these sound delicious! !